Thanks to the magnificent reinforced mass at the breakwater overflow jetty, Marina Chiavari is one of the safest harbour to dock your watercraft. The harbour of Chiavari is made up of an elbow-pier whirring quay, up to the mouth, and a direct flotation wharf for South West. The inner jetty and the North dock are equipped with piers. The whole harbour area is under 24/7 video surveillance, monitored by the local police department to guarantee the highest level of security. Every access in the marina is monitored, the main entrance is regulated with automated barriers and monitored by marina staff 24/7. The marina is staffed by highly qualified personnel, always there and ready to assist all users with mooring. The service is guaranteed 24/7, year round to ensure a safe navigation, and to protect the harbour structures and the environment. 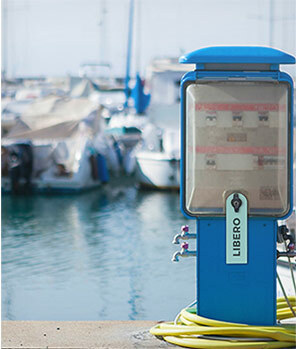 Mooring operations are a service that Marina Chiavari offers to all boats of all sizes, from small craft to large yachts. Marina Chiavari has a helipad which helps in facing health emergencies in Chiavari and in the surrounding area. Every Marina employee is qualified and prepared to perform the necessary duties to assist the emergency medical personnel during this type of situation. Moreover, In the harbour there is an Italian Red Cross clinic for first aid, nursing and pediatric service.